Not unlike some cats do after a snort of catnip, guinea pigs -- without pignip -- will sometimes up and zip around their available space really fast, be it their enclosure or a secure pen. Such behavior could indicate a number of emotions, from pure joy to apprehension. Context is handy for determining what's fueling frenetic cavy behavior. Frequent rapid running around points to a giddy streak in a guinea pig. If your cavy is in good cheer, you might notice him running in circles, constantly shifting his course, whether inside of his enclosure or in a bigger designated play section of your home. Running in happy guinea pigs is often accompanied by leaping. These behaviors together are referred to as popcorning. If your guinea pig is popcorning, he's probably feeling jovial. Perhaps he spots that nutritious and yummy treat in your hand and simply can't contain his enthusiasm. Popcorning is particularly common in youthful cavies. When your guinea pig runs around in his cage, he may be doing no more than simply getting a little exercise. If his enclosure is roomy enough, the lively sprinting could mean he's stretching out his legs and releasing some of his extra energy. Since regular physical activity is vital for guinea pig health and weight maintenance, this is usually a good thing. While leaping and fast running can mean your guinea pig is content, they also can mean he's in terror mode. If something scared your cavy suddenly, you might see him jump and run around in irregular patterns. He might give off a lot of piercing squeaking sounds while he's doing this, too. Many things can trigger such nervous behaviors in cavies, whether unfamiliar surroundings, abrupt motions or jarring sounds from outside. If your guinea pig does this once he arrives at the veterinary clinic for a checkup, don't be surprised. If he does this during a particularly noisy thunderstorm, don't be surprised, either. Speedy running in guinea pigs can sometimes be an indication of health issues, too, perhaps fur mites. Some typical indications of fur mites in cavies, apart from running around quickly, include loss of weight, greasy or dry patches of skin, itching and missing clumps of fur. If you're concerned that your pet's running might be related to any health ailment, schedule an appointment with a veterinarian immediately. If you think your guinea pig's fast running is driven by terror, monitor him. When guinea pigs are in heightened fear modes, they often neglect to notice things that are going on around them. Yours might run so fast that he hits his body against the wall of his enclosure. He might even collide with one of his cage mates, which could lead to injuries in himself or in the other party. 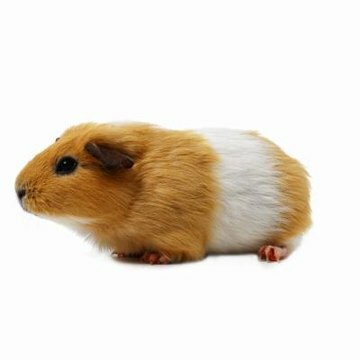 When guinea pigs participate in persistent running due to fear, they often do so until they become extremely fatigued by it all.